This article is about the molecular ion. For the ancient city, see Siwa Oasis. ^ International Union of Pure and Applied Chemistry (2005). Nomenclature of Inorganic Chemistry (IUPAC Recommendations 2005). Cambridge (UK): RSC–IUPAC. ISBN 0-85404-438-8. pp. 71,105,314. Electronic version. 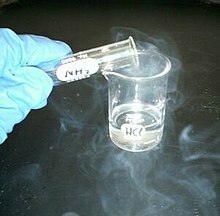 ^ "Ammonium Salts". VIAS Encyclopedia. ^ Britto, DT; Kronzucker, HJ (2002). "NH4+ toxicity in higher plants: a critical review" (PDF). Journal of Plant Physiology. 159 (6): 567–584. doi:10.1078/0176-1617-0774. ^ a b Stevenson, D. J. (November 20, 1975). "Does metallic ammonium exist?". Nature. 258 (5532): 222–223. Bibcode:1975Natur.258..222S. doi:10.1038/258222a0. Retrieved January 13, 2012. ^ a b Bernal, M. J. M.; Massey, H. S. W. (February 3, 1954). "Metallic Ammonium". Monthly Notices of the Royal Astronomical Society. 114 (2): 172–179. Bibcode:1954MNRAS.114..172B. doi:10.1093/mnras/114.2.172. ^ Reedy, J.H. (October 1, 1929). "Lecture demonstration of ammonium amalgam". Journal of Chemical Education. 6 (10): 1767. Bibcode:1929JChEd...6.1767R. doi:10.1021/ed006p1767.